This hexagonal dump bin is perfect for displaying large objects. 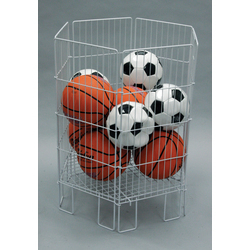 Hexagon shape allows the most product room and open wire design gives customers an easy view of the merchandise. The wire construction allows customers to be able to see into the dump bin. This dump bin is extremely durable and can withstand high traffic environments with ease.